Stay out in the field and out of the elements. 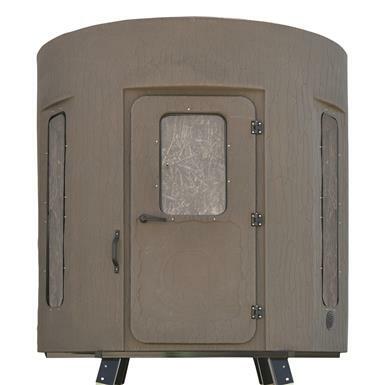 Get set-up faster and stay out longer inside a Banks Outdoors The Stump 4 ‘Vision Series’ Whitetail Properties Pro Hunter Blind. Constructed of rotational molded polyethylene, the same material used in a number of outdoor products subject to weather extremes - it won't rot like wood or crack like fiberglass. Comes with a carpeted floor mat and insulated walls that allow you to move about more freely by muffling the noise inside. Four floor-to-ceiling windows outfitted with camo curtains seal tightly to keep the weather out and your scent in yet open quietly to reduce the chances of startling your prey. A vent kit keeps fresh air flowing in. The rounded corners give you a wider field of view and better shooting angles. A rigid heavy-duty steel plate base allows for secure and easy mounting. The ample 26" x 54" door opens to the outside to make the most of the room inside. The 80" height allows you to shoot with either a bow or firearm from a standing position. Lumber for tower not included. More features for more comfort! Not only do you get more room, the Whitetail Properties Pro Hunter model includes insulation on the walls and a carpeted floor mat to keep your noise level to a minimum. Two folding chairs give you and your hunting pal a place to sit. Plus, 3 gun shelves provide convenient gear storage. Note: This item is shipped by commercial carrier curbside. Unloading is the customer's responsibility, including off the back of the truck. This product ships in one box, measuring 80"l. x 77"w. x 77"h. and weighing approx. 400 lbs. No expedited delivery. High-value orders require a physical street address, otherwise insurance costs will be added to the shipping total. Dimensions: 80"H x 77" dia. Window size: 14" x 22"
Window size: 9.5" x 45"